All AT3 Tactical Brand Products carry a lifetime warranty against manufacturer’s defects. This includes AT3 Red Dot Sights, Handguards, Iron Sights, and any other product that carries the “AT3 Tactical” or “AT3™” name. For other brands (ex. Magpul or Troy), please refer to the manufacturer’s warranty policy. In the event that your AT3™ product becomes unusable, we will repair or replace the product at no charge to you. If we cannot repair your product, we will replace it with a product in perfect working order of equal or better physical condition. The warranty is fully transferable, but we may require information about the original purchase to validate the authenticity of the product. Our contact info is available here. To expedite processing, please provide your order information and description of the defect. Please note: The AT3 Lifetime Warranty does not cover loss, theft, intentional damage or cosmetic damage that doesn’t affect the performance of the product. 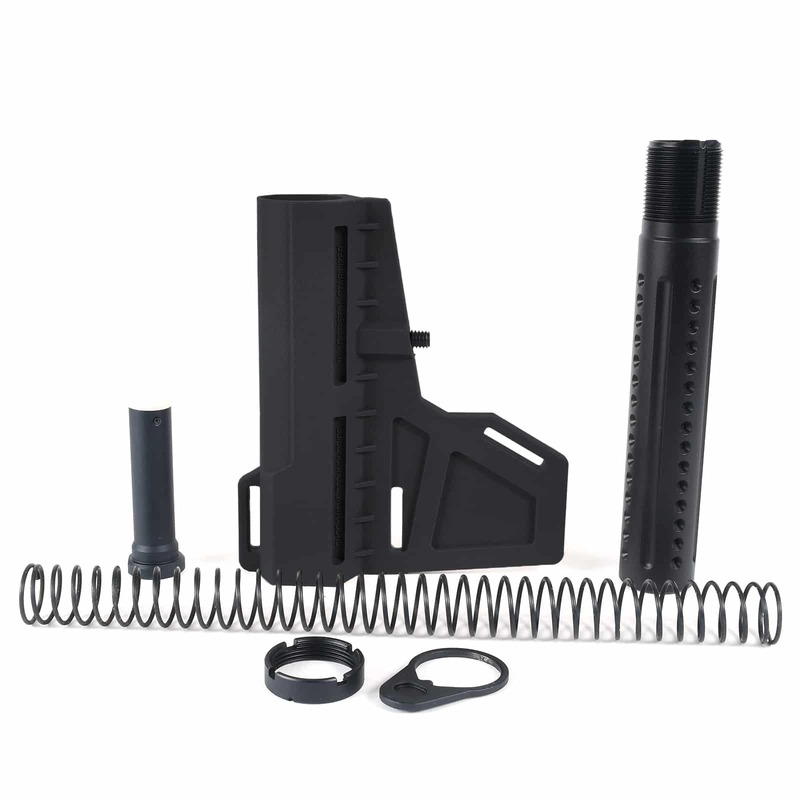 This kit includes everything you need to set up add the KAK Shockwave to your AR pistol! Kit contains a black KAK Shockwave Blade, an AT3 custom buffer tube designed for use with the Shockwave, carbine recoil buffer, action spring, end plate, and castle nut. The custom buffer tube features recessed divots for better attachment of the KAK blade to the tube. Made from high-strength glass-reinforced polymer, the Blade is manufactured to exacting tolerances and fits all pistols equipped with a standard AR-15 pistol buffer tube (up to 1.25″ in diameter). No special receiver extension needed. No half-hour installation process. Just slip it on and tighten the large set screw for a rock-solid installation. This veteran-designed and U.S.A.-manufactured shooting aid improves your marksmanship by providing additional support of your pistol while you still hold and operate it with one hand. The Blade incorporates a vertical “fin,” which you stabilize against the inside of your forearm when in the firing position. Or, you can stabilize the Blade against your cheek for a perfect, steady sight picture. – Fits all pistols equipped with a standard AR-15 pistol buffer tube (up to 1.25? in diameter)—AR pattern, Glock, CZ Scorpion Evo 3, HK9X pattern, etc. Fits very well, easy to install, and it looks amazing! Great addition to the pistol, makes it look complete and alot more aesthetic appealing than the normal buffer tube with the foam end! I will always purchase these for my builds! Great product and price! Thanks for sharing your feedback, Bobby. We're glad you're satisfied with your purchase. Cheers! The buffer tube is amazing, works great on retaining the shckwave blade. Fast shippimg quality product. Found 13.25 inches of pull and love it. Dimples in the tube really helped. Exactly what I needed. Great product and great customer service.